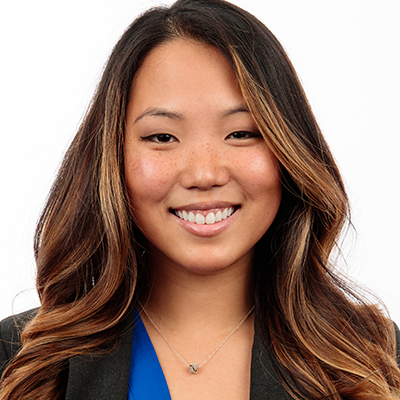 Our featured alumna is Kara Kawakami, who graduated in 2011 with a B.S. in Sport Management. We asked her to share her experiences as a student and bring us up-to-date on her activities since graduating. Tell us about your background—where you are from, your family, etc. My hometown is Pewaukee, Wisconsin—a suburb of Milwaukee. I grew up playing sports (mostly soccer) and enjoying weekends on the lake with family and friends! My parents adopted my younger brother and me from South Korea when we were both babies. As children, they were keen on us learning about our culture and brought us to a Korean Culture Camp in Minnesota every summer. The trip to Minnesota became a fixture in our summer plans to reconnect with friends each year, and I started really considering the University of Minnesota for college. Could you describe your career experiences since you graduated from the U? How long were you in your positions and what have you liked best about each of them? The foundation of my career began through the Major League Soccer (MLS) National Sales Center, where we spent months learning the league and fine-tuning sales skills through week-long campaigns for various MLS franchises. My first role in ticket sales for a professional sports team was for FC Dallas soccer team in Frisco, TX. The biggest takeaway for me was really learning, practicing, and establishing the ability to grow a sales pipeline by making connections and finding ways to bring value to their businesses or creating personal memories through sports. Eventually, I returned to the Twin Cities and left the sports industry for a short time to work on various projects in fundraising, business development, and events. The varied experiences led me back to the industry with the Minnesota Timberwolves and Lynx, in premium and hospitality. Focused on a white-glove service approach, I managed the transition of premium client experience through the completion of the new practice facilities, Mayo Clinic Square and Target Center Suite and Premium Level Renovation. After three seasons with the Wolves and Lynx, I joined Minnesota United FC in 2017 as the Events & Hospitality Manager overseeing premium service, match day hospitality operations, and corporate partnership events. Minnesota United is currently in its second year as an MLS franchise, and building its new home, Allianz Field, in the St. Paul Midway neighborhood, set to open in the spring of 2019. The best part is, no doubt, the ability to be on the ground floor of this amazing organization and help impact the premium experience in small and large ways! As a professional in sports, the opportunity to be a part of such formative moments, especially a stadium project, is something I’m so grateful for. The community surrounding Minnesota United has so much rich history that continues to drive the passion and traditions, and will make Allianz Field an amazing home for our team and fans! How did you decide to choose to study Sport Management? I was originally interested in Kinesiology and Physical Therapy. Then as a sophomore, a few of us students started the U of M Women’s Club Soccer Program, and that jump-started my interest in the business of sports! What were some of your greatest challenges as a student? Best experiences? I struggled pinpointing the direct pathway I wanted out of school and into a career, but I took the approach of jumping into different areas. In the long run, I enjoyed the process and wouldn’t change that. It was so important to me to be involved, and at times I spread myself too thin. I joined Greek life as a sophomore, played club soccer, and worked at the Visit Office for the U of M. I always shared this with people who were worried about the U of M’s size: You can never make a college or university bigger, but you can always make the U of M smaller. Finding my own communities and friends, and choosing the experiences I wanted was important, and the U of M felt like a home. And of course, the involvement beyond the classroom was a great way to learn to manage my schedule and priorities—but most importantly, it helped shape who I am and contributed to my career skill set. How do you think your experience at the U of M has helped you in your career and personal goals? Getting involved in work and student organizations, and fully engaging in the community at the U of M served me tenfold. You learn how to lead your own destiny, grow your professional skills and leadership, and if you’re lucky, walk away with lifelong friends! What advice would you give incoming students who wish to study Sport Management? Ask, listen and do. Informational interviews are a great way to shadow or learn from professionals in the industry. It’s always helpful to see what the on-the-job setting is like and hear all the diverse stories out there. Be the sponge that takes in ideas, advice and feedback. Make sure to take the opportunity to work—your name and work will stay with you throughout your career, and each experience is important. And finally (I heard this great advice recently), whatever you do and whomever you encounter—make a positive impact. October 3, 2018 in FEATURED, PEOPLE, STUDENTS.